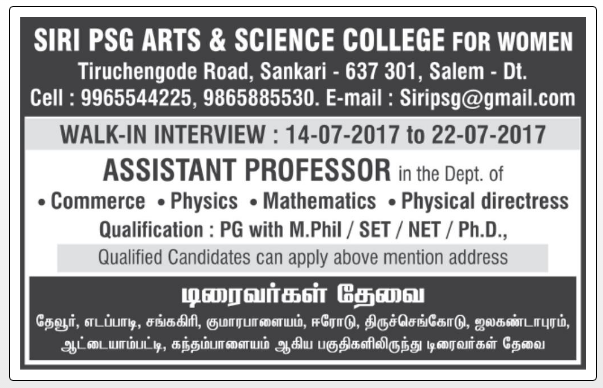 Siri PSG Arts & Science College for Women, Salem has advertised for recruitment of Assistant Professor jobs vacancies. Interested and eligible job aspirants are requested to apply as soon as possible from 21st November 2018. Check out further more details below. About College: Siri PSG Arts and Science College is a Women's institution affiliated to Periyar University, Salem District, Tamilnadu, India. The institution provides education and training that maximize the knowledge and skills which makes the students capable of competing confidently in the global workspace. Siri PSG Arts and Science College for women provides State-of-the art facilities which also possesses extra curricular activities and training programs for the students to develop their personality and individual talents which help them to learn successfully. How to apply: Interested and eligible candidates are requested to send applications along with Resume, copies of certificates and recent PP size photo to the following postal address.